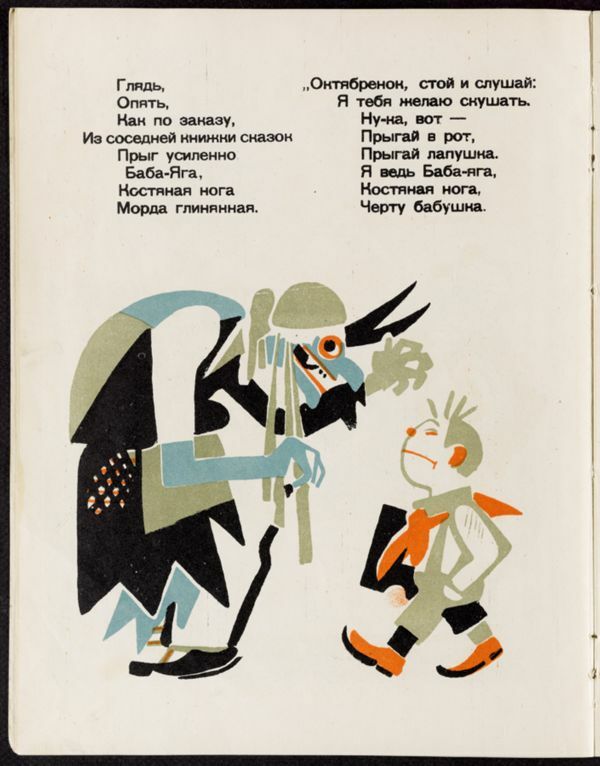 In the period immediately following WWI and the Bolshevik Revolution, Soviet children’s literature experienced a sharp severance from traditional storytelling forms. In particular, the degeneration of the classical fairytale mold established a rift wide enough for the Soviet government to construct and institute a different model altogether. This reformation of the fairytale was part of a broader shift in Soviet pedagogy, established during the First and Second All-Russian Congresses on Pre-School education, which moved away from a “natural childhood” model to that of the “revolutionary childhood.” Under this new pedagogical strategy, education -- and the children’s books intended to further that education -- were intended to empower children to become active participants in the revolution and prepared them ideologically for Soviet adulthood (Kelly, 70-71). With Soviet pedagogy taking a decided shift toward strict ideological instruction, pre-revolutionary fairytales were discarded as silly and bourgeois. According to Felix J. Oinas, “a special Children’s Proletkult sought to eradicate folktales on the basis that they glorified tsars and tsareviches, corrupted and instigated sickly fantasies in children, developed the kulak attitude, and strengthened bourgeois ideals” (Oinas, 77). Of the most widely circulated folktales were those featuring Ivan Tsarevich, a stock character from the 19th century best known in pre-revolutionary Soviet tales, most notably, “Tale of Prince Ivan and the Grey Wolf.” In The Little Octobrist Rascal we witness a variety of unexpected fairytale favorites, including the return of Ivan Tsarevich and the famed Hunchback Pony, whose originating tale, Little Hunchback Horse, was denounced by a censor for lacking ideological soundness (Kelly, 73). Lenin’s widow, Nadezhda Krupskaya was an avid advocate for the reformation of children’s literature in line with the new Soviet pedagogical approach and the broader political revolution. This shift against pre-Revolutionary fairy tales and children’s stories necessitated the creation of new, strictly Soviet tales. Improved storylines rejected religious overtones or otherwise unrealistic influences and predicated themselves on children’s initiative to drive the plot. This guided shift in children’s literature accompanied systemic establishment of the Pioneer Movement, which began under Vladimir Lenin in 1922 and continued throughout most of the 20th century. The Little Octobrist organization, of which the protagonist of this story is a member, was also established as a precursor to membership in the Pioneers for children too young to join. As a preliminary scouting group for children who would ultimately join the Communist Youth League (Goldman), the Pioneer movement epitomizes Soviet governmental control of childhood development through socialist indoctrination. In fact, a critical component of the pioneering movement was the reinforcement of the fluidity between child and adult responsibilities. Actively encouraged to engage the public directly in the political process, passing out magazines and speaking at public meetings, pioneers also organized agricultural work and were depicted in many children’s stories as seamlessly managing play and work (Kelly, 67; McGill University). We now turn more explicitly to the fairytale at hand, The Little Octobrist Rascal. The author, Nikolai L. Agnivtsev, was both a poet and playwright by trade prior to his two year exile following the Bolshevik Revolution. He was fixture among the artistic bohemian groups in Petersburg after having studied philology at Petersburg University. Following his return to Russia, Agnivtsev was a prolific children’s book author, writing over twenty children’s books (Steiner, 184). Many of his children’s books centered around child heros which Steiner argues provided a palatable vector for theories of revolution and ideological instruction: “Clothed in childlike ingenuousness and mischievous play, the typologically similar but deadly serious adult modeling of real life looked a little less frightening” (Steiner 79). In addition to Oktiabrenok Postrelenok, the children’s book Vintik-Shpuntik was emblematic of Agnivstev’s efforts to reconstruct the traditional folk story around a new Soviet folk hero with a distinctly Constructivist edge (Steiner, 85-86). Vintik-Shpuntik tells the story of a small screw, part of a larger machine, which instigates a strike after being insulted. Thus Oktiabrenok Postrelenok fits within Agnivstev’s broader effort to reform folk tales (skazki) to fit within a Soviet paradigm. The fairytale’s illustrator, Ivan A. Maliutin, was a caricaturist, technical draftsman, and theater designer born in 1889. After studying at the Stroganov Institute, he worked primarily on designing theater costumes for the S. Zimin Opera until the Bolshevik Revolution. After the revolution, Maliutin’s work was displayed along with the Fifth State Exhibition: “From Impressionism to Non-Objective Art” from 1918 to 1919. Maliutin also worked with Cheremnykh and Mayakovsky on posters for the Rosta Telegraphic Agency. Aside from this visual work, Maliutin published in satirical magazines including Bezbozhnik (Milner, 278). Together, Maliutin and Agnivtsev created The Little Octobrist Rascal, which tells the story of a young Octobrist, who was on his merry way to school when Ivan Tsarevich appeared out of the blue. The prince implored the Octobrist for aid, but the young man laughed, shrugged off the solicitations and plodded on. Suddenly, Baba Yaga leapt from a storybook and blocks the boy’s path. She threatened the lad, but he remained unfazed and even mocked the fairytale, telling the Devil’s grandmother to quit her vain fear-mongering. However, when fear fails to sway the Octobrist, the storybook turns to bribery. A beautiful fairy materializes and offered our youthful patriot three magical items - a flying carpet, a sturdy steed, and a cornucopia of a picnic blanket. But our child hero was unperturbed. He shrugged away each item, told the fairy to cut the lies, and assured her that the Governmental Organization of Societal Nutrition would be quite unimpressed with her picnic blanket. Why indulge in such things when one has an airline, trolleys and radio receivers? These are the true marvels of Soviet modernity; fairytales are empty promises. Balina, Marina, Helena Goscilo, and M. N. Lipovetskii. Politicizing Magic: An Anthology of Russian and Soviet Fairy Tales. Evanston, IL: Northwestern U Press, 2005. Goldman, Leah. “The Collective.” Adventures in the Soviet Imaginary: Children’s Books and Graphic Art. University of Chicago Library,. 1999. Kelly, Catriona. Children’s World: Growing up in Russia, 1890-1991. New Haven, CT: Yale University Press, 2007. Milner, John. A Dictionary of Russian and Soviet Artists: 1420-1970. Suffolk: Antique Collectors’ Club Ltd., 1993. Oinas, Felix J. “The Political Uses and Themes of Folklore in the Soviet Union.” Journal of the Folklore Institute 12., 1975. Steiner, Evgeny. Stories for Little Comrades: Revolutionary Artists and the Making of Early Soviet Children’s Books. Trans. Jane Ann Miller. Seattle: University of Washington Press, 1999.